within Ecole Polytechnique Fédérale de Lausanne (EPFL). designed by internationally known Japanese architectural unit SANAA. to provide flexible environment for the students to relax, discuss or inspire by themselves. It was such a honor to host an event in the place like this! Kaze no Mori/Takacho sake from Yucho Shuzo in Nara. like beef carpaccio with truffles and goat cheese, grilled veal and macaroons. and awakening fresh carbonation was great aperitif with an amuse using goat cheese. went perfectly with smoked salmon with coconut foam dish. This sake was served at the Nobel prise award dinner in Stockholm, Sweden last year. Kagawa's wild child "Kawatsuru Bizen Omachi, Tokubetsu Junmai Muroka Nama Genshu"
was best warming to 50 degrees to match with the veal. Macaroon and Nigori was unimaginably great! a neutral mixture of French, German, Italian and other languages and cultures. on learning about Japanese culture and Sake. and this visit made me feel the potential of Sake market in this country. Big big thank you for Ms. Shiraishi in Geneve, who had coordinated this event and brought me over! It was so great to meet all of your family members and friends. 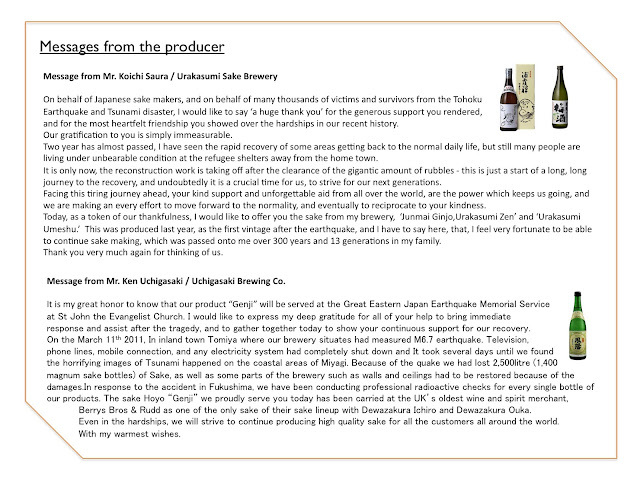 including personal reflections of his visit to the area affected by earthquake and tsunami last summer. The beach once likened as "Gokuraku Jōdo", the Pure Land Paradise by a by the buddhist priest. "Beauty of the velvety sea kelp laid and shined in the feather light on the seashore"
the scenery he faced after the earthquake and tsunami. a time to weep and time to laugh, and a time to be silent, and time to speak"
"Hana wa Saku" and "Home Sweet Home" and "Amazing Grace"
I was thinking of the people in Japan. and Miyagi prefecture lost the most; 9,535, then Iwate 4,673, and Fukushima 1,606 people. are still living under the evacuated shelters and residences. Two year feel like a forever, yet feel like yesterday at the same time. and being a part of continuous support in my possible way for the area's restoration. I had promised myself again at this ceremony . Urakasumi "Zen" Junmai Ginjo and Hoyo "Genji" Tokubetsu Junmai. Because of the area some people there had never tied sake before. Many of them had amazed how wealth and delicate the flavours of sake were. This is my big Sake sister Rie Yoshitake, who supported me so much for this event. to Shu Tomioka san for the photography. 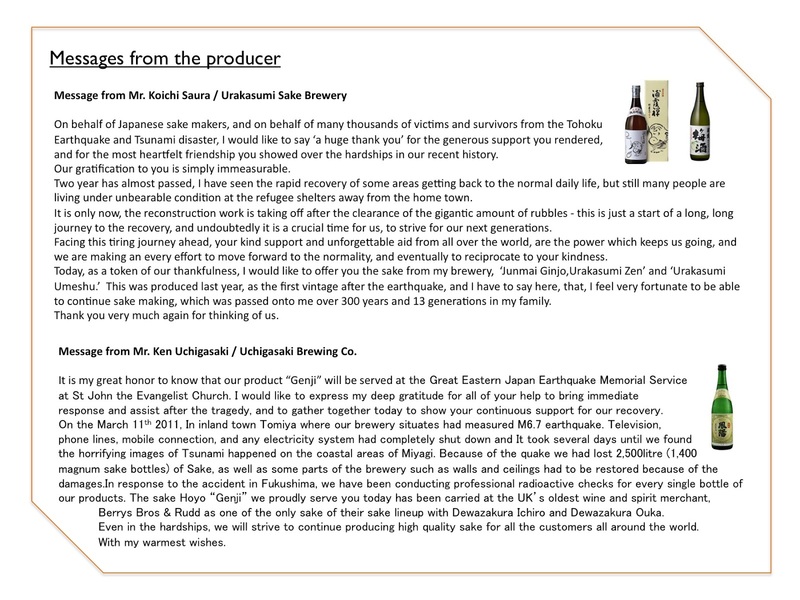 and to World Sake Import, Hoyo and Urakasumi breweries for the Sake donation!